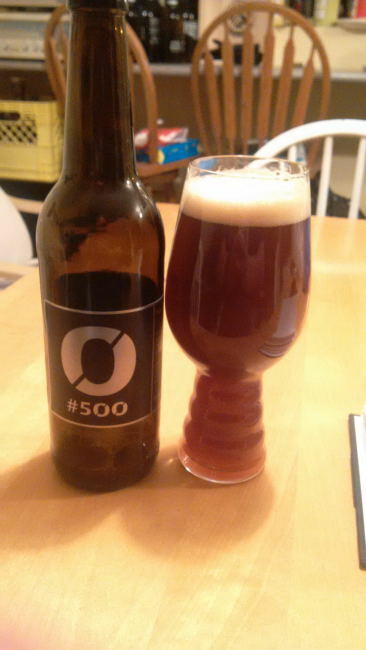 From Grimstad Norway’s Nøgne Ø comes their “#500 (Imperial IPA)” a beer originally brewed to mark their 500th batch of beer. So to go with the number 5 there are 5 different malts and 5 different hops used in this brew. This Double IPA pours a deep cloudy colour (Rusty) with a tan head. The aroma consists of caramel, some fruits, malts, earthy with floral hops. The flavour is of smoke, caramel, malts, fruits, earthy and big hops bitterness. The alcohol content comes in at 10% with a very big 100 IBU. Nøgne Ø should be very proud of this beer as it is an amazing double IPA and worthy of being a landmark beer. Commercial Description: When Nøgne Ø decided to make its 500th batch of beer, it was quickly established that the key numbers would be 5 malts,5 hops, 10% alcohol and 100 IBUs. The result is an incredibly rich and hoppy Imperial IPA. Malty enough to be almost a barley wine, but intensely fruity, mainly because it is dry hopped with generous amounts of Nelson Sauvin hops from New Zealand. This entry was posted in Double IPA, Imperial and tagged big bitterness, big hops, bitter, bitterness, caramel, double india pale ale, double ipa, earth, earthy, fruit, fruits, grimstad, hopped, hops, hopy, imperial india pale ale, imperial ipa, india pale ale, IPA, malt, malts, malty, Nøgne Ø, norway, smoke. I should grab this, I love a big IPA with some malt content too!